The book’s manuscript was long believed to have been lost. Recently, however, a typescript constituting the first volume of the project was unexpectedly discovered at the University of Konstanz. In this volume Feyerabend explores the significance of myths for the early period of natural philosophy, as well as the transition from Homer’s “aggregate universe” to Parmenides’ uniform ontology. He focuses on the rise of rationalism in Greek antiquity, which he considers a disastrous development, and the associated separation of man from nature. Thus Feyerabend explores the prehistory of science in his familiar polemical and extraordinarily learned manner. The volume contains numerous pictures and drawings by Feyerabend himself. It also contains hitherto unpublished biographical material that will help to round up our overall image of one of the most influential radical philosophers of the twentieth century. Paul Feyerabend (1924-1994) was Professor of Philosophy at the University of California, Berkeley. "Feyerabend famously quipped that the only rule of method is that anything goes. Philosophy of Nature sheds light on his transition from critical rationalist to epistemological anarchist. Ranging from Stonehenge and Homer to Bohr and Einstein, the book creatively explores the relations of mythological thought to philosophy and science." 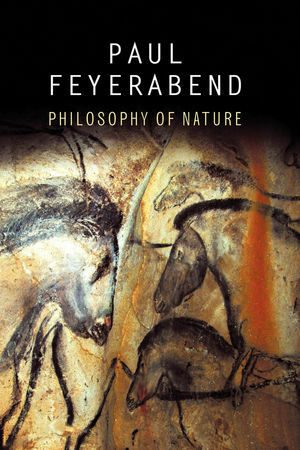 "In this book, we can see another side of this multi-faceted figure: Feyerabend as a historical philosopher of nature and as an analyst of the development of ancient Greek philosophy. This puts some of his apparently outrageous positions into perspective and reveals their sometimes quite sophisticated background."